Much literature is available discussing the concept of globalization, but now it is time for some practical advice on what it actually means for an organization. Globalization: The internal dynamic and Globalzation: The External Pressures can be read independently or as a complement to the other. The aim of both books is to present an all-round dissection and a one-stop source of latest thinking on the topic of globalization. The focus is both on issues that arise within the internal workings of an organization and on the pressures that come to bear from outside. Globalization - The External Pressures brings together a picture of how organizations are responding on a macro scale in terms of their interfaces with an increasingly global environment. 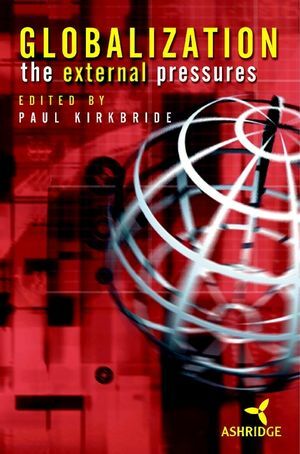 The State of Globalization Today (P. Kirkbride, et al.). The Globalization Process in the World Economy (J. Heptonstall). Global Labour Markets (J. Duncan). On the Internet All Business is Global (Like it or Not) (M. Malmgren). Managing Global Partnerships and Alliances (R. Pudney). Managing Global Customers (H. Hennessey). The Global Pharmaceutical Industry (M. Schofield). Faces of Globalization (S. Burns, et al. ).